Usually, aurorae happen when the solar wind blasts the Earth’s atmosphere. 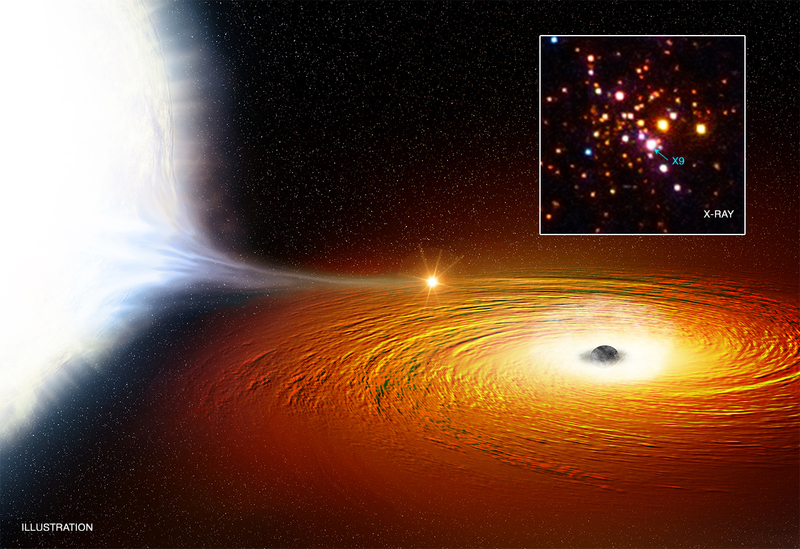 However, black holes may also have a shot at producing their very own northern lights. What’s more, we might even be able to observe this light display in the future. Simulating a rapidly spinning black hole, two researchers from Japan modeled an accretion disk spinning with it. Inside this disk would be superheated plasma and as it rotates it might act like a dynamo, charged particles generating a magnetic field looping through the disk. But this magnetic field wont stay confined to the disk for long. Due to inertial effects, the magnetic field would be dragged into the event horizon, causing the magnetic fieldlines to ‘attach’ themselves to the black hole. Assuming the accretion disk continues to generate a continuous magnetic field, a global black hole ‘magnetosphere’ would result. As you’ve probably seen in the striking imagery coming from the high-definition movies being produced by the Solar Dynamics Observatory, magnetic fieldlines close to the solar surface can fill with solar plasma, creating bright coronal loops. This hot plasma fills the loops, feeding around the magnetic field like a hosepipe filling with water. The same principal would apply to the black hole’s magnetosphere: the looped magnetic field feeding from the accretion disk to the event horizon filling with plasma as it is sucked out of the disk (by the black hole’s dominating gravitational field). As you’d expect, the plasma will fall into the black hole at relativistic speeds, converted into pure energy, blasting with intense radiation. However, the Japanese researchers discovered something else that may happen just before the plasma is destroyed by the black hole: it will generate a shock. As predicted by the model, this shock will form when the plasma exceeds the local Alfven speed. For want of a better analogy, this is like a supersonic jet creating a sonic boom. But in the plasma environment, as the plasma flow hits the shock front, it will rapidly decelerate, dumping energy before continuing to rain down on the event horizon. This energy dump will be converted into heat and radiation. This fascinating study even goes so far as predicting the configuration of the black hole magnetosphere, indicating that the radiation generated by the shock would form two halos sitting above the north and south ‘poles’ of the black hole. From a distance, these halos would look like aurorae. So there you have it. From a spinning black hole’s accretion disk to shocked plasma, a black hole can have an aurora. The black hole aurora, however, would be generated by shocked plasma, not plasma hitting atmospheric gases (as is the case on Earth). This all sounds like a fun theoretical idea, but it may also have a practical application in the not-so-distant future. Last year, I wrote “The Event Horizon Telescope: Are We Close to Imaging a Black Hole?” which investigated the efforts under way in the field of very large baseline interferometry (or “VLBI”) to directly observe the supermassive black hole (Sagittarius A*) living in the center of our galaxy. In a paper written by Vincent Fish and Sheperd Doeleman at the MIT Haystack Observatory, results from a simulation of several radio telescopes as part of an international VLBI campaign were detailed. The upshot was that the more radio antennae involved in such a campaign, the better the resolution of the observations of the ‘shadow’ of the black hole’s event horizon. If the black hole’s event horizon could be observed by a VLBI campaign, could its glowing aurorae also be spotted? Possibly. How are Black Holes Used in the Movies? I mean, is the spaghettification of John Cusack using awesome 2012 doomsday graphics too much to ask? Instead of an improbable alien spacecraft appearing over the White House, why not use a black hole, producing so much tidal shear that it rips the building apart brick-by brick? Oh, and then have all the matter being sucked into the black hole accelerate to relativistic velocities, creating an X-ray belching accretion disk, lighting up the solar system with our planet’s regurgitated mass-energy? Movie audiences will have a total doomgasm over that! Or we could just use it as a nifty time travel device. *I just saw this on Graph Jam, had a giggle. More sci-fi black holes please! Author Ian O'NeillPosted on January 15, 2010 Categories Black Holes, Featured Articles, HumourTags 2012, accretion disk, Black hole, doom, Humour, Sci-fi, spaghettification8 Comments on How are Black Holes Used in the Movies?